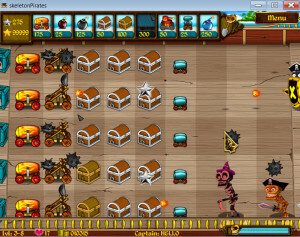 Are there any cheats for Skeleton Pirates? Yes and no. To learn more about how the one cheat I’ve found in the game work, click here. What is the maximum amount of gold stars you can collect? The counter will stop going up at 99,999 however that doesn’t mean the counter actually stops. You can keep collecting gold stars and the internal counter will continue to give you credit for them, even though the screen will appear to have stopped counting them at 99,999. On games that I know I won’t need an extra weapon spot, I will put in the gold treasure chest and collect extra gold stars just to keep my count maxed out so that later in the game I won’t need to worry about it. What are the best weapons in the game to choose for any given round of play? Although sometimes this will vary because you have certain pirates that have to have certain types of weapons, my favorite selection for the start of an average game is shown below. By selecting those exact weapons, you can pretty much breeze through any level of play. I always start out by placing two treasure chests, then by the time I’ve placed by second treasure chest, the first skeleton pirate appears. I place the twin mini cannon to take care of him. 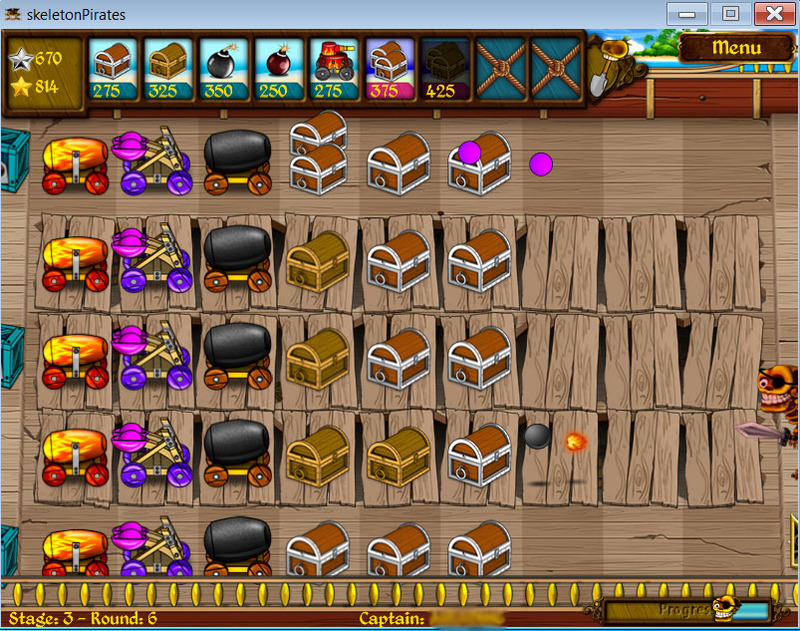 I continue placing treasure chests and twin mini cannons until my first Hat Pirate appears. For him I put down the Jack Cannon. The Hat Pirate is stronger than the twin mini cannon so you’ll need something stronger for him. 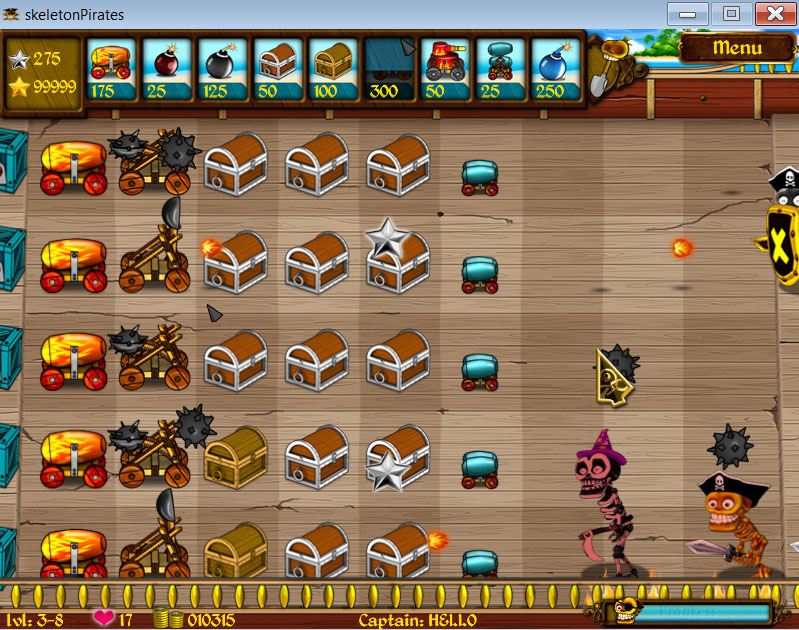 I continue to put down treasure chests and jack cannons on each lane until I have one jack cannon on every row. By then I inevitably have two full columns of treasure chests so I start saving up to place down a Mace Catapult next to each Jack Cannon. Then there is nothing you can’t beat. Despite what the game guide may lead you to believe, the mini cannon and twin mini cannon are not in fact the same strength. Although they both cost only 25 gold coins, the twin mini cannon is stronger. The game guide tells us that the twin mini cannon is just like the mini cannon only it shoots both forward and backwards and that the backwards shell is stronger than the forward shell. While this may be true, the forward shell on the twin mini cannon is still stronger than the mini cannon shell. So since they cost the same amount, why even waste your time with the mini cannon? Just get the twin one and have more power for the same cost. Will you show a sample of how you layout your defenses? Sure. 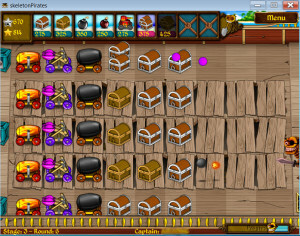 Here is a screenshot of one of my games. You’ll find this layout and weaponry selection works perfectly for almost any high end battle. Here is another layout I used from a game level 3-8. As you can see I use basically the same formula every game, just mixing up which main weapon(s) I use. And once you have 99,999 gold stars, I found you never need more than 1 or 2 gold treasure chests every couple of games, to keep that topped off.